We will be adding new Press Releases and links to press articles on the web, if you would like us to keep you up to date as items are released or published please complete your details in the registration form below. Isagi are delighted to have been awarded the Silver Award for Best Hardware Product at the Totally Tools - Totally DIY Show held at the Ricoh Stadium, Coventry. 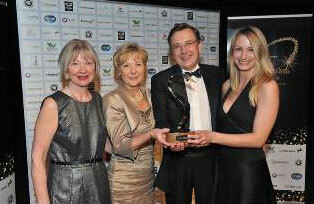 The award was for the range of StayPut by Isagi Antimicrobial - BS8445:2012 Standard Bath & Shower Mats. Click here to take you to our product page. Click here to take you to the full list of awards and winners. to stop mattresses slipping off bed bases. And now the material, the StayPut 1.4mm ECO PER®, comes with an added advantage after recently being successfully tested to British Standards. 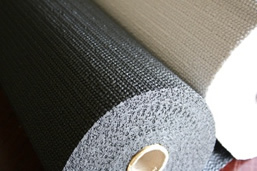 It conforms to BS EN597-1&2:1995 which covers fabrics tested over both Fire Retardant (FR) and non-Fire Retardant (non-FR) foam. In addition, the fabric has the attraction of being OEKO-TEX 100-Level 1 (safe for baby articles), phthalate free. It does not contain PVC or Toxic Metal. Isagi have received a great review about the Isagi Anti Slip Trays from Buckinghamshire MP Cheryl Gillan. MP Cheryl Gillan has praised a company’s new non-slip trays as ‘fantastic’ after testing to see how they help people with mobility problems. Former Cabinet Minister Mrs Gillan bought a tray from Isagi Ltd after visiting the company – and was so impressed that she now vows to purchase more for Christmas. “They provide a marvellous invisible grip on things, so, for people who might be a little unsteady or wobbly on their feet, the tray provides a secure base for a glass or whatever is being carried on it. They also grip your lap if you are using them to eat a TV dinner. 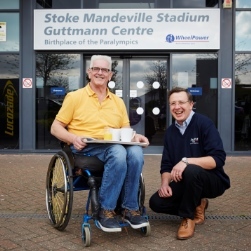 Isagi have donated 50 NEW Anti-Slip trays to Wheelpower, the national charity that has its Headquarters at the Stoke Mandeville Stadium - home of the Paralympics.